The reader is advised to first read The Archives of Horz (http://www.erbzine.com/mag42/4299.html). and also other stories that may follow with sufficient reader encouragement. 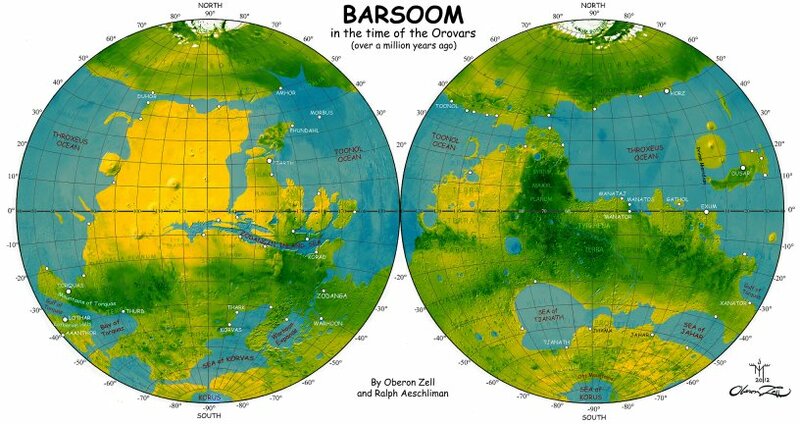 The Fall of Ancient Barsoom (http://www.erbzine.com/mag44/4497.html) provides additional background context. Too little has been written about ancient Barsoom! My name is Saran Tal, and I am the Archivist of Helium. Recently, I had the fortune to accompany John Carter to Horz, what was hitherto thought to be dead and abandoned hundreds of thousands of years ago. Much to my surprise, the city was very much not dead, and in fact had a small and thriving Orovar community intact since ancient times. The greater surprise was the presence of an intact and comprehensive library from those ancient times. I have spent the last year with others of similar inclination extracting the secrets contained within the library. It is my pleasure to share with you one of the very oldest stories I found within, from a magical time when great oceans provided opportunities for those willing to seize them, and the specter of a dying Barsoom had not yet reared its head. Exum stank, but then it always did. Exum was known to us traders as “a great place to trade, but a terrible place to live.” The smell was one reason, and the heat and humidity that aggravate it were the others. However all of this was offset by Exum’s location at the confluence of multiple ocean currents – making it the crossroads between the sea-faring trading routes of the north and of the south of Barsoom. This was my fifth voyage to Exum, and, as always when we neared a port, I stood in the Blue Malagor’s bow with my hands on the rails waiting for the first site of land. However, the stench in the offshore wind could be detected over the horizon, and used to guide a ship safely to harbor. Situated at the mouth of the great Parnassis River, the effluvium of the equatorial jungle, along with the smoke from jungle being burned off for cropland, washed out of the continental interior and mixed with the town’s aroma of paper works, smoke houses, tanneries, and docks overcrowded with trading fairs and ships. My name is Baxtam, by my mother Bonat's First Born people, and Bax Tam Lo, by my father Tam Ban Lo's Orovar family. I am the union of two peoples and their hopes to form strong ties across the Sea of Jahar to the benefit of all. Many rich ships from around Barsoom entered the Sea of Jahar and traded at the great market of Xanator. As a young man from that city my father sailed the Sea of Jahar, trading the many goods found in the great market for the agricultural products of the Southern plains which, coupled with my father's youthful shrewdness and wit, enabled him to quickly gain favorable reputation and status across the region. A partial share on a single trading ship grew into ownership, and within a few short years a second ship and then a third. The Jed of Jahar, Bexar, desiring relationships beyond the realm of the First Born, invited my father to his court where through his wit and charm he caught the fancy of Bonat, the beauteous daughter of the Jed. With much pomp and ceremony the two were eventually wed in the presence of the leading families of Jahar, the Jeds of the other First Born cities, and the heads of the trading combines of Xanator. Thus began a time of great prosperity around the shores of the Sea of Jahar, resulting in wealth for many and, within a few short years, my birth. As would be expected, I was brought up within the growing wealth of Jahar in the palace of Bexar. What started as a great hall of skeelwood and stone soon expanded into a palace of marble during my youth. Father was usually at sea on one of his ships, but I still saw him frequently and was often regaled with his stories and gifts from far-off places. Growing up, my peers' favorite game was play acting as either wealthy caravan merchants, ranchers, plantation owners, or the Dators who protected them from banths, wild calots, or green men. While I eventually played all those roles my lighter skin, bronze curly hair, and knowledge of the larger world thru my father's stories inevitably cast me in the role of the Orovar merchant from across the sea who would come to the docks of Jahar, ready to select from the best of their goods. Thus, it was only natural that, at the earliest age possible, I convinced my parents to allow me to accompany Father on a voyage to the great market of Xanator. I will always remember that first sea voyage. My precociousness quickly turned into my helping the sailors with their chores, save only for climbing the great masts to set the great lateen sails, which my father forbade. Other than that, I steered the ship (under close supervision), cleaned the decks, fed the animals, and helped the cabin boys with the various unsavory chores with which they were tasked. The ship's marines, a mixed group of all races serving as the ship's guards, adopted me as one of their own, and proceeded to teach me the use of the sword and the bow. This my father encouraged, as he saw in my eyes and my heart that I would follow in his footsteps. He especially encouraged my friendship with Gur, a somewhat shorter than usual green man who regularly sailed as a guard in my father's employment, and who he realized could teach me the valuable skill of surviving a duel with others of his kind, as his relatively diminutive stature had encouraged him to do so. I well remember the humbling experience of that first lesson. With practice sword in hand I faced off with Gur on the weather deck of the ship. Gur stood in front of me, waiting, holding a sword in each upper arm. I looked him in the eye, and said, "Now what?" At that moment, Gur....blurred....and I had the points of his practice swords at my throat. "You're dead, boy", Gur said. "You waited for me, and that was your first mistake," he paused. "And your last one." I hung my head in shame, and started to stammer an apology. "Stop that! Listen, and learn. If you see a green man with drawn swords in front of you he WILL attack you. It is his nature. Attack him first! Get under and inside his arms' reach and kill him quickly. Gur beckoned to Raxat, one of the Dators. "Watch," Gur told me. Gur raised his swords. Raxat, a Dator of the Calot Lodge, ran across the deck, drawing a pair of knives as he ran, leaping when he was little more than a swords-length from Gur with the knives outstretched in front of him. The knives blurred close to Gur's torso, and then Raxat turned his leap into a diving roll, tucking and turning as he landed, and came to his feet so he faced Gur with the knives in his hand. Gur looked at me. "Had Raxat not been a friend, and this had been a real fight, I would be on the deck now with all my entrails spilled out for display. Size doesn't matter -- skill and doing the unexpected is what matters, and doing it faster than your opponent can." I looked up at Gur. "But won't my opponent also be trying to do that?" Gur chuckled and patted my head, "Of course he will! You just have to do it better. That will take much work. Let us start now." “Trader!” a loud voice interrupted my reminiscing and suddenly brought me back to the present. I turned to face Sam Tar El, the grizzled old sailing master of the Blue Malagor. “It will be dark before we reach the docks. Do you wish to hold off-shore until the morning, or chance a run into the river in the dark?” asked Sam Tar El. I looked at the sky and considered the wind direction and strength. “I think we will have to tack considerably on the approach. I fear the shifting sand bars within the estuary. As laden as we are I think it wiser to hold off-shore until morning.” I said. Sam Tar El looked relieved, and his posture relaxed. “Very well” he said. Sunrise brought a freshening wind, and the flat sea soon acquired a decided ripple. I arose with the sun and joined Sam Tar El by the great steering wheel on the raised quarterdeck, where he was shouting orders to the crew to raise anchor and set sail. A nod was all he could vouchsafe me. "Permission to come up, Trader?" a piping voice asked. I looked down to see the two cabin boys -- Taxor, my cousin thru my mother's sister, and Hel Tam Lo, another cousin thru my father's family. The two had become fast friends on the voyage north, and were inseparable. They were apt pupils, and soaked up everything the crew and marines would teach them with an astonishing seriousness. "Permission granted, Junior Traders,” I half-joked. Someday they might be traders themselves -- it wasn't too early for them to start acting like one. Together the three of us watched the great gaff-rigged sails set by the crew, the ship first wore against the breeze and then, with a snap of the sails and catch of the wind, the ship heeled and we sailed toward Exum. Exum grew large and we soon converged with other trading ships who had shared our overnight vigil and were on their way in-bound to the port. As we closed on the docks we were met by the Harbor Master of Exum, with his small squadron of ketches with harbor pilots who quickly ascertained all of the entrants’ cargoes and then deftly directed us to specific quays -- a Harbor Pilot assisting Sam Tar El in his labors. Taxor turned to me and exclaimed, "This does not look like Jahar or Xanator!" We looked at broad avenues lined with great wooden buildings, all on stilts, fronted with wooden quays, with a further backdrop of the great jungle. I chuckled, "no, it does not, nor will it ever. You will never see a city of marble here. Why, do you think?" He looked puzzled, and it was Hel Tan Lo who supplied the answer, "I see no hills, where stone would be quarried. Yet I see a great forest where wood is plentiful." I answered, "True, but there is another reason." Taxor had figured it out. "The river must rise at times, and flood the city. Building on stilts would keep the buildings dry." he said. I said, "You have the princess! Now keep yourselves out of trouble while I speak with the Port Inspector." "Ho, Blue Malagor. What cargoes and what for the Great Market?" This from a Port Inspector, who stood on the quay next to the weather deck of our ship, looking up at me. “We carry thoat hides, dried thoat meat, flour selk, the finest wines of Jahar, and polish-grade carborundum. We also have a small number of bronze swords, spear points, and arrow points. What lacks the Great Market?” I answered. “Your thoat hides and meat will find ready buyers, as will your selk and wines. The rest could probably sell here, but there are better markets for that than here at Exum,” said the Inspector, with a tilt of his head. This was interesting, and I needed to hear more. “Perhaps you will want to sample some of the Jahar wines, so as to attest to their quality?” I offered. The Port Inspector smiled, and rapidly made his way up the gangway. I invited the Port Inspector to my day cabin, and bade him to make himself comfortable. A glance and gesture to Taxor sufficed for him to present both of us with goblets of Jahar’s finest – at least the finest that we currently had in our possession. “Have you heard of Horz?” the Inspector asked. “Horz lies at the mouth of a great river, similar to Exum. As is with Exum, this river provides an excellent harbor. The city actually lies on a plateau above the river, so it is proof from floods. But there is more” he said. “The Northern continent holds vast forests of skeel, much like your Southern lands. As such, many shipwrights have made their home in Horz, and many fine Horzan ships now ply Throxeus and soon other oceans. However, the Northern continents also possesses a myriad of game both large and small, unspoiled by man, whose furs find much market in lands to the South, AND THERE ARE NO GREEN MEN. Men such as us are free to tame the wild lands secure in the knowledge that their only enemies are the wild animals, and their own mistakes.” He paused, drained his goblet, and looked to Taxor for more wine, which was quickly provided. I escorted the Inspector to the gangway, and then called for Sam Tar El. I motioned for him to walk with me to the quarterdeck. “We have a decision to make,“ I stated. Sam Tar El just looked at me, and raised an eyebrow. I continued, “We could sell our cargo here, and then sail home, or we can instead sail north and see firsthand some new markets of which I have just heard. We won’t be the first in, but clearly few have yet made the long voyage north past Dusar, since I am just hearing of them myself.” I then related the rest of my conversation with the Port Inspector. I made my way to the Inn of the Wayward Sith a bit later. As it was now late afternoon many of the day’s arriving ships had already unloaded their cargoes, released or paid off their crews, and the tavern was now filled with sailors determined to drink or gamble their wages away. A few would be looking for new berths, and I was hoping we might find a seasoned sailor or two with knowledge of the northern waters. Sam Tar El saw me enter, and once he saw that my eyes had grown accustomed to the dimness within he waved me over to a low table where he was engaged in discussion with several likely looking candidates. This was good fortune! “And these others?” I asked, with a hand gesture taking in what appeared to be another Lotharian, and also a swarthier individual who background was not obvious. Even better! I turned to Kas Oran, getting right to business since he was a known quantity. “I pay standard sailors wages, with a bonus should pirates close within fighting distance. You are also free to trade your own items, and will be permitted the standard modest cargo space for them, for which I will deduct a token fee from your wages should you use it. Sam Tar El has no doubt told you of our interests – the markets of Horz and Du’Haa. Do you wish to sign on? “Very well,” I said, turned, and voiced the same question to them. They both answered as required, and the Blue Malagor had three new crew members.